"You can write better software than this..."
1. What is Guid-O-Matic for? Globally unique identifiers (GUIDs, also known as Persistent Identifiers) are an integral part of the global biodiversity information network as it is currently envisioned. They provide a way to identify and access information about physical objects, conceptual entities, and information resources. GUIDs have three characteristics: they are unique, they are persistent, and they are actionable. This last characteristic means that a human can receive a webpage representation of the resource by entering the GUID in a web browser. It also means that a semantic web client can retrieve machine-understandable metadata about the resource in the form of a resource description framework (RDF) file through the web. The concept of actionability is central to the Linked Data principles. A GUID that uses a standard "URL-style" format is called an HTTP URI. A central challenge to implementing GUIDs is creating the RDF files in XML format as required by the Linked Data principles. Guid-O-Matic is a very simple application that converts comma separated value (CSV) specimen metadata files into RDF/XML structured in a manner appropriate for biodiversity resources. These metadata files can be exported from database software or created directly from Excel. Once the RDF/XML files are loaded onto a webserver along with appropriate stylesheets, URIs that refer to those files can be used as fully functional GUIDs. 2. How does Guid-O-Matic work? NOTE: This is just a summary to give you the idea how it works. Click for full instructions for using Guid-O-Matic with your own data. A. Metadata for the specimens is saved in two files: one for the specimens themselves, and one for the determinations of the individuals represented in the specimens. Click here to download an Excel file that contains sample data. B. The Guid-O-Matic program reads in the metadata from the tables and merges it with more general information about the institution holding the specimens. 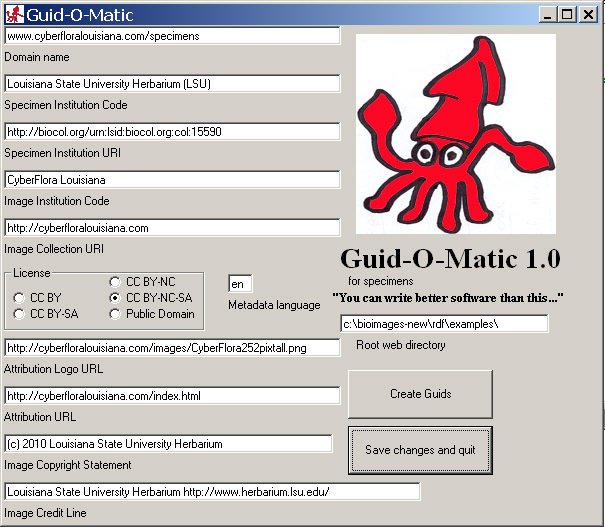 Click to download the Guid-O-Matic source code (Visual Basic, text format). C. The program creates one RDF/XML file for each specimen. Click here to see an example RDF file. E. The RDF files are placed on a web server for the domain that forms the base of the URI. In addition, an XSLT stylesheet that describes how to translate the RDF into a web page is placed on the server. 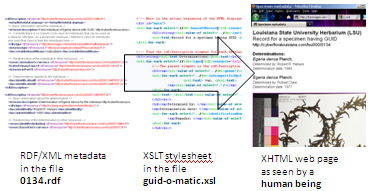 When a human tries to view the RDF in a web browser, it is translated into a web page by the XSLT stylesheet. The way that the web page is displayed (font, font size, etc.) is controlled by a normal CSS stylesheet. In the example, the style sheet has the capability of using different styles for web browsers on computers, iPhones, and iPads. F. One setting must be made on the server (one time) to link the HTTP URI to the RDF file. Voila! The GUID is actionable. Because the RDF/XML file underlies the web page, it can also be retrieved by a Linked Data client which can understand the relationships and properties among the described resources. This method of content negotiation has been dubbed (by me) as RDF And XSLT (RAX). * Because cyberfloralouisiana.com has not reached a final decision on URI format, these links are "spoofed" and actually point to a different URI. However, they do use the RAX method as described above. Full instructions for using Guid-O-Matic with your own data.